Saturn's rings are not calm and serene but full of chunks of ice crashing into each other. Nasa scientists have found the frozen rings - just tens of metres thick - can hurl ice thousands of many miles into the planet's upper atmosphere. The rings also have an unexplained red element which could either be rust or small molecules similar to those in vegetables like carrots, Mirror.co.uk reports. 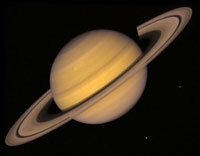 San Francisco Chronicle has reported that each of Saturn's rings is labeled by a letter according date when it was discovered. Between Saturn's A and F rings lies a space 200 miles wide called the Encke gap. The gap holds several "ringlets" and gravity from a strange object named Pan, only 12 miles in diameter, disrupts the rings and causes waves along their edges. Another gap exists between the thin ringlets of the Encke gap. It is called the Keeler gap, and here Cassini has discovered a lumpy little moonlet only 5 miles across that is also creating waves on the edges of Saturn's rings. Amid all of Saturn's rings and ringlets lie 13 significant gaps, where Cassini mission scientists have been hunting for evidence of other moonlets. The absence of moonlets inside Saturn's C ring remains "baffling," the scientists say. "Here's this giant crystalline structure, stretching two-thirds of the distance from Earth to the moon, and yet parts of it change on a monthly or weekly time scale," said planetary scientist Jeff Cuzzi, from NASA's Ames Research Center in Moffett Field, California. The edges of the thickest of Saturn's rings, A and B, for example, "kind of flop back and forth, sometimes pointing one way and sometimes another, sloshing around like water in a tank," said Cuzzi, co-author of one the new studies, National Geographic reports.